System virtual machines: Virtual machines that provide the functionality needed to execute an entire operating system on a host machine. Process virtual machines: Virtual machines that are designed to execute programs in a platform-independent environment. They can also be referred to as Managed Runtime Environments as they manage their own runtime environment and processes on the host machine. The EVM may be loosely classified as a process virtual machine. The Ethereum Virtual Machine is a quasi-Turing complete machine which implements the execution model of the Ethereum blockchain by providing a runtime environment for smart contracts to be executed which then alter the state of the blockchain. In computing, a machine is said to be Turing complete if it can solve any problem that a Turing machine can, given an appropriate algorithm, the necessary time and memory. On the EVM, the appropriate algorithm is implemented with smart contracts while the memory is represented by a virtual byte-array ROM. The EVM is referred to as a quasi-Turing complete machine because unlike machines based von Neumann architecture where computation is bounded by memory and time, computation on the EVM is bounded by a parameter called gas. Gas is unit cost of executing an operation on the Ethereum computation engine. Before a program (smart contract) is executed on the EVM, the gas cost for each operation in the program is estimated in advance and then paid for as each operation in the program is executed. This limits the number operations that can be executed by the EVM per program, as programs can run out of gas. On the EVM, memory grows as needed. There can be no out-of-bounds memory access, you only pay the gas price for a change in memory size. The execution model of the Ethereum blockchain specifies how the system state (blockchain) is altered given a series of bytecode instructions, compiled from smart contracts by the EVM compiler, and some environment data. The system state is represented by a chain of immutable transactions which have been executed, mined and permanently stored on the blockchain. Every time new transactions are executed and mined, the blockchain is transitioned into a new state. The role of the EVM is to implement this execution model by providing a runtime environment for smart contracts that have been compiled to bytecodes by the EVM compiler to be executed, manage execution of transaction initiated by contracts and then transit the blockchain to its new state. 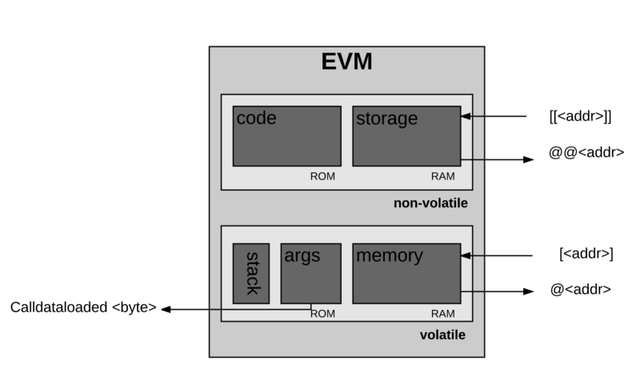 The EVM is a simple stack-based architecture. Computation on the EVM is done using a stack-based bytecode language which is like an intersection between BitcoinScript and Assembly language, adding the recursive message-sending functionality of Lisp. The word size of the machine is 256-bits (32-byte), this is also the size of a stack item. The word-size of a machine is an ordered set of bits/bytes in which information may be stored, transmitted or operated on within the machine. The function of the EVM stack is to store the results of intermittent execution of bytecode instructions (opcodes). The size of every item on the EVM stack is 256 bits. If the size of the data item is not up to 256bits, it is padded with leading zeros. The stack has a maximum size of 1024. The memory model of the EVM is a simple word-addressed byte array. This means that the memory is an array of bytes, each byte is assigned its own memory address. The EVM has a storage model which is a word-addressable word array. Unlike the memory which is volatile, storage is non-volatile and it is maintained as part of the system state. All locations in both storage and memory are well-defined initially as zero. Every computational step taken in process of executing a program must be paid for upfront, thereby preventing Denial-of-Service (DoS) attacks. When computational steps are paid for upfront, any malicious program which intends to execute infinitely on the EVM will eventually run of out gas at some point, thereby ensuring that the execution of that malicious program does not deny other programs the use of the EVM. Programs may only interact with each other by transmitting a single arbitrary-length byte array; they do not have access to each other’s state. Program execution is sandboxed; an EVM program may access and modify its own internal state and may trigger the execution of other EVM programs, but nothing else. Program execution is fully deterministic and produces identical state transitions for any conforming implementation beginning in an identical state. These restrictions have helped to shape the design decisions of the Ethereum state transition machine. Relationship of the EVM with High-level contract-oriented languages like Solidity.